It is an idea that seems intuitively like it should work. Instead of us all separately driving a car to where we need to go, we’ll build some kind of transit system that will take us there. No parking. No traffic. You can read a paper on your way. What’s not to like? The problem is that public transit, and especially rail transit, does not work, except in areas with exceptionally high population density. The transit statistics for 2017 just released by the American Public Transit Association (APTA) once again reinforce this lesson. Overall transit ridership was down for the fourth straight year. Transit ridership topped out in 2014 at 10.7 million trips per day. 2017 was down just under 3% to 10.1 million daily trips. 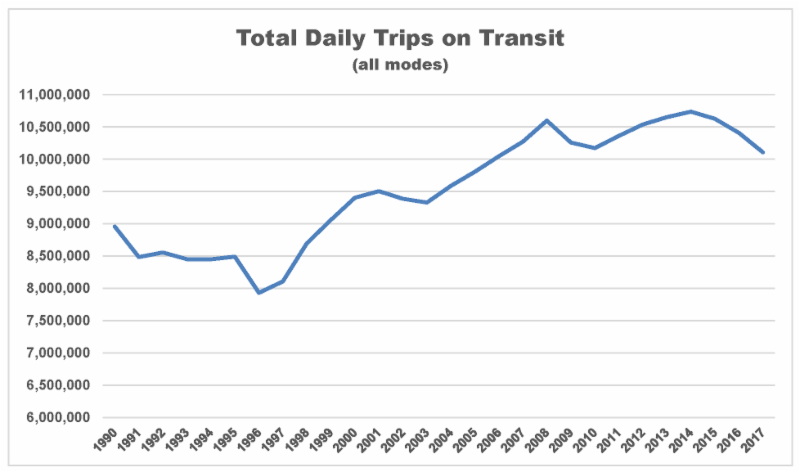 This is notwithstanding a massive increase in transit spending over the last three decades. In 2015 inflation-adjusted dollars, the total amount spent on transit (operating expenses plus capital expenditures) has tripled from $22 billion to $68 billion. 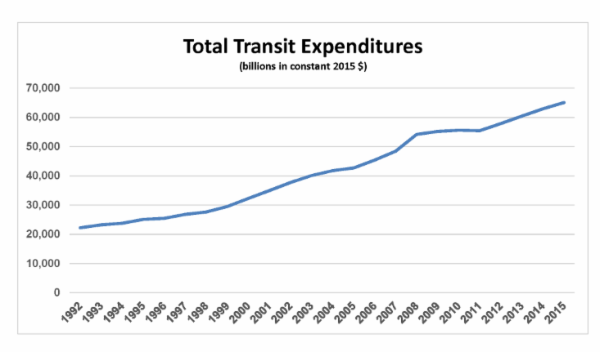 Since 1992, we have spent right at one trillion dollars on transit. Fares paid by riders cover only about a quarter of these costs. That means taxpayers who do not ride transit are spending over $50 billion per year to subsidize those who do. In 2017, trips on transit were less than 1% of the total daily trips taken by Americans. That works out to the 99% of Americans that don’t use transit paying about $160 per year for the 1% that do. The value to the 1% who ride transit is about $14,000 per year. There are those that argue that the public sector also subsidizes automobiles. But that is largely not true. Most highway construction is paid for with the gasoline tax. In fact, many states (including Texas) have diverted gasoline taxes to other uses. Local streets are paid for with property taxes, but because the property owners who pay those taxes benefit from the connectivity to their property, the costs and the benefits are also largely aligned. But the transit subsidy is financed with general sales and income taxes, which have almost no correlation to transit ridership. There are certainly arguments in favor of subsidizing transit from general revenues. Some contend that transit relieves congestion generally and, therefore, benefits the public at large. However, in areas with relatively lower population densities, like Houston, the data on whether transit actually reduces congestion is mixed at best. Certainly there are no cases were transit has ever “solved” congestion for any city. Indeed, the cities which spend the most on transit have the worse traffic. And there are situations where transit actually increases congestion. For example, we can no longer time the traffic lights downtown because of the light rail’s interference. Probably the better argument is that transit provides mobility options for those who cannot afford a car or are physically unable to operate one. But whether we are going about those tasks in the most efficient way is an open question. For $14,000 per year, you could buy a lot of Uber trips. There is a lot of speculation about why ridership is falling. Many attribute the decline to the rise of ride-share companies like Uber and Lyft. 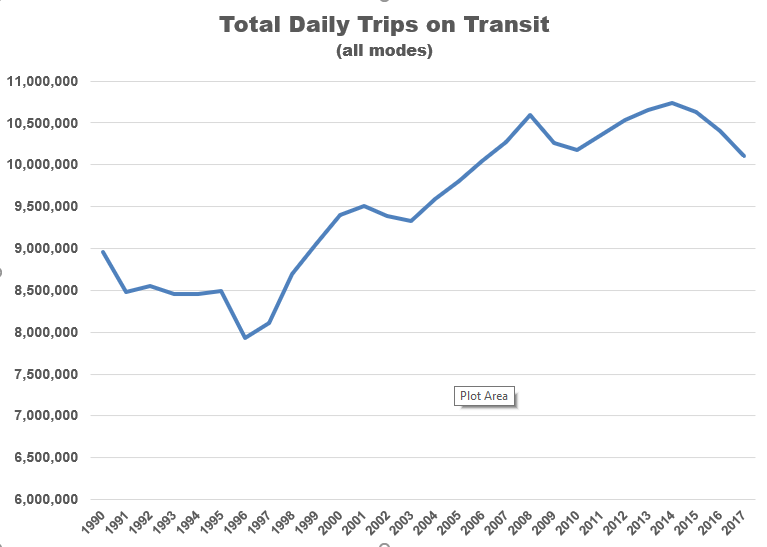 There is certainly a correlation between the increase in ride sharing and transit’s decline, but I have not seen any studies that have been able to show actual causation. But it is clear that we are in the midst of a technological revolution in transportation. The most important thing is that we don’t spend a lot of money on inflexible infrastructure. I suspect that in the not too distant future, we are going to look back on our light rail experiment in Houston as the City’s worst ever white elephant. We have plenty of obvious transportation needs. Our streets are deplorable. Traffic signals are uncoordinated. HGAC has identified nearly a hundred intersections that need to be reconstructed. The highly effective Park-and-Ride system needs investment. Let’s do the obvious stuff and stop wasting any more money rail (or bus lanes on city streets!).P.S. – While I was finalizing this post, a story appeared in the Houston Chronicle reporting that Metro was considering spending $70 million on new rail cars. More on that next time when we look at Metro’s ridership numbers.